This tutorial presents how Beebotte can be used to monitor Carbon-monoxide levels in the air. We will use Arduino Uno board to report data to Beebotte and an MQ-7 sensor to detect CO gas levels. Open your Arduino IDE, click on Sketch tab and go to Include Library to install PubSubClient and ArduinoJson libraries. In this tutorial, we will use a ready made MQ-7 sensor module. If you wish to build your own module, you can buy the required parts and solder them to a PCB (this is beyond the scope of this tutorial). Analog Output AOUT: Gives an analog voltage output in proportion to the amount of CO level the sensor detects. Digital Output DOUT: If the analog voltage reaches a certain threshold, it will set the digital pin DOUT to high. Once DOUT pin is high, the arduino will trigger the LED to turn on. 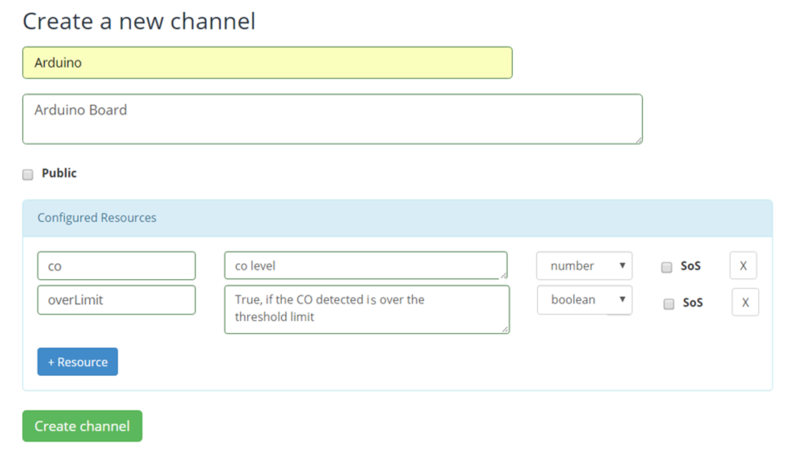 In this example, we will send AOUT and DOUT values to Beebotte to be able to monitor CO levels from anywhere using a Dashboard. For the purpose of this tutorial, we will create a channel named Arduino and add a resource co with type number and another resource overLimit with type boolean. will use Beebotte MQTT endpoint to send sensor data to the created channel. We need to specify the channel token, and to indicate the names of the channel and resources. In the code snippet below, we will initialize constants, definitions, MQTT client and all the pin connections of the sensor and the LED. Two variables, overLimit and rawValue, are also declared. These will be used to store the values of the analog pin AOUT and digital pin DOUT. In the Sketch setup function we will open serial communications for debugging and initialize the Ethernet connection. The complete code along with other Arduino examples can be accessed on Github. In your account page, go to My Dashboards and click Create Dashboard; enter a friendly name and a short description for your dashboard then add 2 Attribute Widgets and 2 Timeline widgets. For every widget, indicate the channel and resource where data will be read from. Voilà. 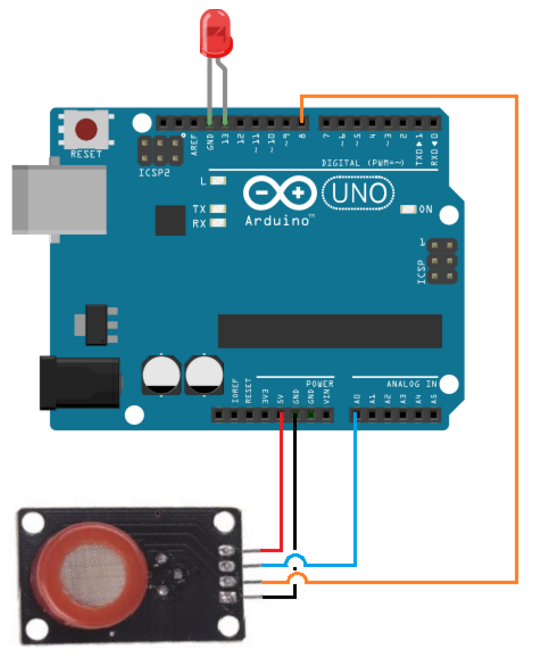 In this tutorial we learned how to connect a CO sensor to Arduino to read gas levels and send them to Beebotte using MQTT. We have also learned how to create a channel to store the data received from Arduino and a dashboard to display that data.